As we get so close to the end of the year, I want to share some good migraine news with you. Today is December 30, and I've had only two migraine attacks this month That's true progress for me, and I'm calling it my migraine miracle. There's no cure for migraine disease at this time, but this is definitely the next best thing. By January of this year, my migraines were down to six to eight per month. In June, the Spring TMS device, which was approved by the FDA for the acute treatment of migraine with aura in June of 2014, became available to patients without having to be enrolled in their trials of the device for migraine prevention. In July, I started using the Spring to abort my migraines and twice a day to see if it would help me with migraine prevention. Below is a graph of how many migraines I've had each month since then. The purple indicates the number of migraines; green indicates migraines aborted by the Spring TMS; red indicates migraines for which I had to take meds. There are many elements in my having been able to go from chronic migraine back to episodic. Obviously, the changes in my treatment regimen were hugely successful. Botox and the change from Effexor to Cymbalta made a huge difference, taking my migraine and headache days down from 25 per month to six to eight per month. As you can see from the graph, the Spring TMS may have been responsible for reducing the number of days even more. Another significant change is a reduction in triptan use when I get migraines. 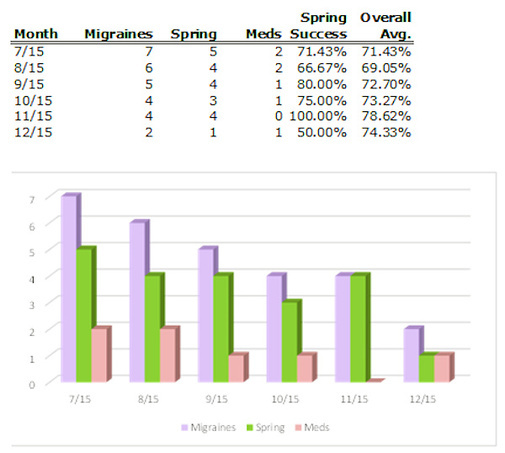 Without the Spring, I would have used Axert for all of the migraines during this period, 28 of them. Thanks to the Spring, I needed Axert for only seven migraines. A solid partnership with my migraine specialist, Dr. David Watson. (Please see Managing Migraine - Teri Robert and Dr. David Watson.) Dr. Dave never gives up. He encouraged me and helped me not to give up. Add that to his knowledge and skill, and it's a winning partnership. As 2015 comes to a close, my fondest wish for each and every one of you is better migraine management and the higher quality of life that comes with it.